Good afternoon! It is a great pleasure to host this ceremony to welcome home the 22 Chinese artifacts and one fossil forfeited in the United States. These treasures are symbols of the ancient Chinese civilization and our Mother Nature. They are also the common heritage of mankind. Their return to China will facilitate our fight against illicit trade in archeological objects, and help us better preserve cultural heritage for our future generations. On behalf of the Chinese Embassy, I would like to express our sincere appreciation to Assistant Secretary Ryan, Deputy Director Ragsdale, and many others for helping these treasures find their way back home. Their recovery is the result of seamless coordination among so many people from various agencies of China and the United States – from diplomats to scholars, from police to customs officers, from border control to immigration officials. It is indeed another testament to the width and depth of China-U.S. Relations. As human beings, we all cherish our cultural heritage, which in many ways tells us where we come from, who we are, and where we are going in the future. Therefore, both China and the United States give priority to cooperation in cultural heritage preservation. In recent years, China-U.S. cooperation in this regard has made steady progress. In 2009, our two countries signed the MOU on import restrictions of archaeological materials. As one of the important deliverables of President Xi Jinping's state visit to the United States last September, the two sides reaffirmed their commitment to enhance cooperation on preserving cultural heritage by agreeing on returning forfeited Chinese artifacts. By translating this agreement into reality today, we are not only enhancing our shared values in cherishing cultural heritage, but also raising public awareness of combating illicit trade in archeological objects. The return of these ancient artifacts is also conducive to expanding cultural exchange between our two countries, which helps us understand more about each other, foster empathy, and build trust. The year 2016 is the China-U.S. Tourism Year. We should take this opportunity to further enhance our cultural exchange and cooperation. 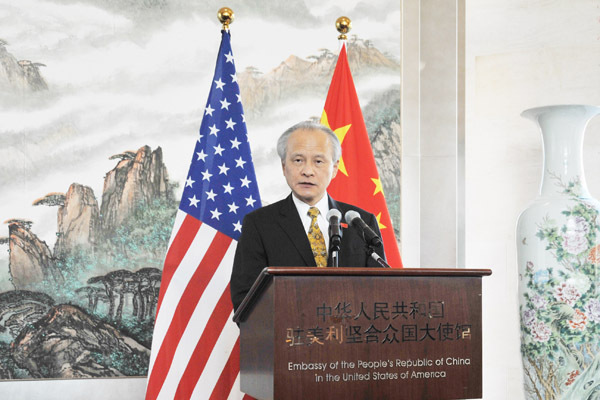 I believe that with the joint efforts of the two sides, China-U.S. cultural exchange will make new headway and contribute to the growth of China-U.S. relations in the years to come. When the 22 artifacts arrive in China, they will bring home with them the friendship and goodwill of the American people. The fossil, to be loaned to the Carnegie Museum of Natural History for exhibition, will tell in silence another story of China-U.S. cooperation. In a word, they will become another bridge of communications between our two great nations. As the Chinese Ambassador, I look forward to working together with you all to build more bridges.